Anticipating your customer’s moving needs is the key to having the answers to the questions they are certain to have. Putting yourself in their shoes is the most effective way to determine what they need to know and the best ways to convey the information. Considering the following can help you prepare your clients for the move ahead and the ways your mobile storage solutions can facilitate their relocation plans. This is a demographic with a lot of potential for the mobile storage industry. Older, alone, and often without the physical strength or friends needed to help with a move, this demographic needs to know how your services make it easier for them to achieve their moving goals. This is a no-nonsense demographic and short brochures that discuss security, safety, convenience, and the cost will go a long way toward answering many of their questions. Young professionals, college graduates, and couples just starting out typically won’t have a lot of money to spend. While they may have friends who can help them pack, they may not have friends who can help them haul their stuff away. Convenience and cost are the most important factors for this demographic, and they will have lots of questions about these two aspects. Families need flexibility, and you can bet they will have a lot of questions related to the convenience and flexibility of your services. Mobile storage offers both in spades, so these are aspects you want to develop answers for as they relate to families. Moreover, mom and dad are going to need reassurances regarding the reliability of the move and the pick-up and delivery times. Finally, always keep in mind that families have lots of things on their plate, even more so when they start packing up, shutting utilities off, putting houses on the market, etc. Addressing these questions from the perspective of a parent will go a long way towards earning their trust and their business. 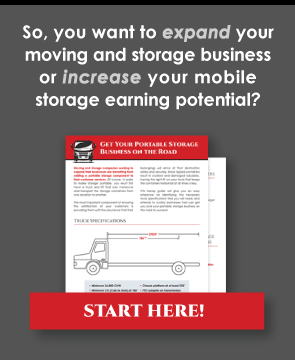 Business owners and contractors can benefit considerably from the use of mobile storage. It provides a simple, safe, and expedient manner of clearing a space within the business or making way so that remodeling can be completed without damaging personal property and possessions. Contractors and business owners are going to be focused on the brass tacks of the operation and the bottom line of the bill. They will also want to know about flexibility and scheduling, so they can fit the move and redelivery within their schedule. Realtors love mobile storage because it makes it easy to declutter property and prepare it for sale. This is a demographic that can become a steady and stable source of revenue for your operations. As such, it is a good idea to prepare materials for them that discuss everything from the affiliate commissions you are willing to offer to the benefits mobile storage provides their clients. Fires, floods, tornadoes, and other natural disasters happen with little-to-no warning. As a result, disaster response professionals need a “Johnny on the Spot” solution to clear away the clutter and sort through the debris later. They will have lots of questions regarding expedient service and the ability of your operations to respond rapidly to their needs with the right containers and equipment. An ounce of preparation in crafting your materials so that they are full of the answers your clients need will generate dollar after dollar of business. Putting yourself in the shoes of your target demographics is an investment that pays significant dividends.